Shark Fashion Show 2018 is Super! Spring is coming...an the Girls are Ready to Run! Third Grade Art Displayed at Longwood - Again! Pursuing knowledge and spiritual identity with confidence and kindness for students of all faiths. Join our thriving community dedicated to academic excellence, character development, and global citizenship. Challenging students to think critically, collaborate effectively, and communicate clearly - skills that last a lifetime. Serving and valuing each individual is the essence of community at St. Anne’s, on a local and global level. Achieving victories big and small through teamwork, sportsmanship, competition, and skill building. Students have the opportunity to continue learning after the school day ends. Choices range from Soccer Shots to Lego Club. Inviting you to invest in the future of our children and our independent school community. Fostering creativity, leadership, and the desire to serve others. We always love to hear news about our alumni and we encourage them to share their life experiences after St. Anne’s. Our Middle School boys did not let a little snow get in their way of a game of four square. Our teachers outside for recess with their students during last Friday's snow storm. In 8th Grade STEM, students made observations and comparing/contrasting different types of fossils. The 8th grade is devoted to "love is an action verb" for the month of February and will actively be showing acts of kindness for each school day. Tradition is an important part of being an Episcopal school, and our Peace and Justice Chapel to honor Dr. Martin Luther King, Jr. is an important one at St. Anne’s. An annual tradition dating from our earliest years, it is fitting that this all school chapel is led by some of our youngest learners. With the simple clarity the very young possess, they remind us that peace is both simple and central to our lives. This service begins with the entire school lining our hallways in silence, waiting for the sound of Kindergarten teacher Kari Kalloo’s drum. When the drumbeat starts to echo down the hall, heads crane in that direction to get a glimpse of our young marchers as they come into sight. Kindergarteners parade past “the big kids,” holding their peace signs high as they lead the way into the gym for our all school chapel service while their elders fall into line behind them. First graders share Dr. King’s story in this chapel, each reading a short part of it. No matter how many times we hear his story, most hear something new each time it is shared. My dream is that Dr. King would be able to walk into our school and say, “My dream has come true” here at St. Anne’s. Our Peace and Justice Chapel to honor Martin Luther King, Jr. is very profound, every year. 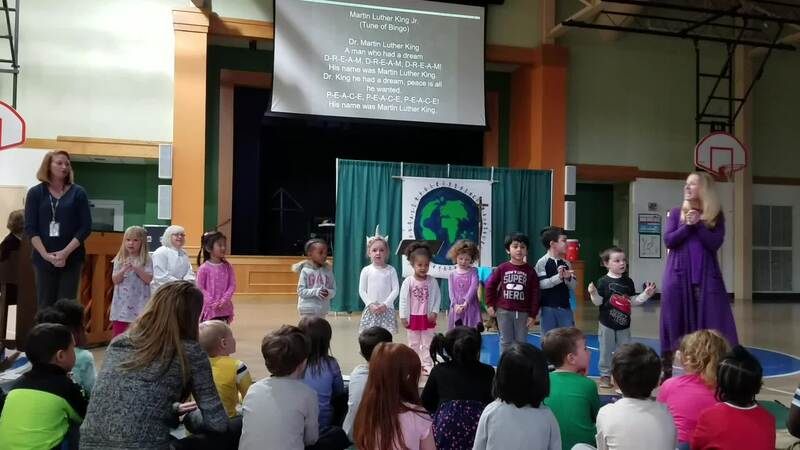 We are inspired by our youngest learners who remind us of Dr. King’s life, what he believed, and that his dream is within our reach if we continue to strive to attain it. On Thursday fourth grader Hunter Skelton and Head of School Peter Thayer traded places for the day, fulfilling the gift of being “Head of School for a Day" won in our 2017 live auction. The trade was great fun and educational for both parties. Mr. Thayer had a wonderful day as well in the role of a 4th grade student. He was able to brush up on his Singapore math skills and journal about them, learn about the difference between revising and editing, hear more about Westward Expansion and the Trail of Tears, and reaffirm that we have great teachers and kids at St. Anne’s. He also met with his PreK buddy, created a color wheel in art, and played the recorder in music class (first time since 3rd grade, he reports). It was a great day. The Dalai Lama writes, "Love and compassion are necessities, not luxuries. Without them, humanity cannot survive." Inspired by this quotation, 8th grade students in both homerooms have generated a list of acts of kindness they hope to perform including but not limited to writing notes expressing their peers' strengths and celebrating each others' successes, writing notes of appreciation to teachers and staff, creating a kindness chain, attention to "self love," helping each other study, verbally giving sincere compliments throughout the day, volunteering to help their peers and teachers, taking better care of their school environment, writing letters of love to their parents, grandparents, siblings, etc. The 8th graders' focus on the idea of being servant leaders this month is just one way they can focus on serving with compassion. We are proud of the character development of every student at St. Anne’s! The Lions Club Peace Poster program is an annual worldwide competition, and this year there were approximately 600,000 entries from around the globe. In our area, there are 36 Lions Clubs with 1300 members, all of whom promoted this competition to their constituencies. Once again this year, St. Anne’s art teacher Amy Sherman encouraged sixth graders to conceive and create a piece of art to submit. Finalists were judged by area artist Sara Jones, a graduate of the Delaware College of Art and the Rhode Island School of Design. Make your student’s yearbook extra special! Yearbook recognition ads are a great way for parents, families, and friends to commemorate student achievements and important milestones. “Yearbook signing” is an end of year tradition at St. Anne’s, and students are always excited to find a special message from their parents, grandparents, and special friends! 1. Choose your ad size and layout. 2. Enter your text and upload your photos. Click here for more information and answers to Frequently Asked Questions, or call Jostens' customer service (800-358-0800).